Code is easy, State is hard. Learning how to deal with your monolithic relational databases in a microservices structure is key to keeping pace in a quickly changing workplace. 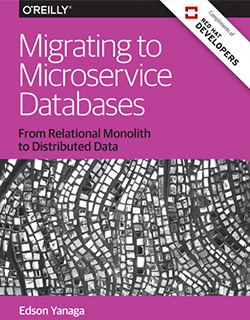 There are many approaches and in this book, author Edson Yanaga, takes you through nine different strategies for integrating data from your monolithic application to a microservice architecture. When signing in using social media accounts, those accounts may use information for their own purposes. We recommend you view the privacy notice of those social media accounts. Register in-place to create an InfoQ account and then your download of this asset will begin instantly. Please tell us a little bit about yourself and your company. We use the statistics about our members to create content of interest to you. The latest software developments, trends and insights delivered to your inbox. Subscribe to our newsletters. InfoQ produces a number of optional newsletters. These emails are human-curated but not personalised to individual subscribers. (Weekly Newsletter Sample, QCon Special Report). Sent twice a week featuring summaries of the best content published on InfoQ in the last 7 days plus special reports from our QCon conferences. A monthly overview of things you need to know as an architect or aspiring architect. Sent once a week on specific topics (Microservices, AI, DevOps, etc.) rounding up the best content published on InfoQ in the last 3 to 6 months. This email keeps you updated on the latest software innovations before others, provides early access to video presentations from our global QCon conference where innovative companies share their approaches and learnings to shape your projects, and offers advice from industry leaders pushing the envelope in new technologies, practices and methods. Please note: we will share your InfoQ account details - contact info, company role, location - with this sponsor.